Order 219670224938720, paid using Lazada wallet. Money deducted from my credit card but order status show as pending payment. Lazada customer service asked me to cancel order and reorder. After cancel the order and pending the refund back to Lazada wallet, this never happen. Filed multiple complaint and get no response back from them. Keep asking to wait for tomorrow and the tomorrow never come. Being waiting since last week 18 April but until now no response. Customer service mention will call me back on status but never happen. Beware on using Lazada wallet for any payment, this is a scam!!! I repeat Lazada wallet is a scam!! Hi, I'll purchase some items in Lazada. The items that i received is totally different compared to the items that i ordered. So, I already return back the item that i received. My concerned is why one item only refunded compared to other my 4 items that i purchased.What happen to my other 4 items that I purchased??? 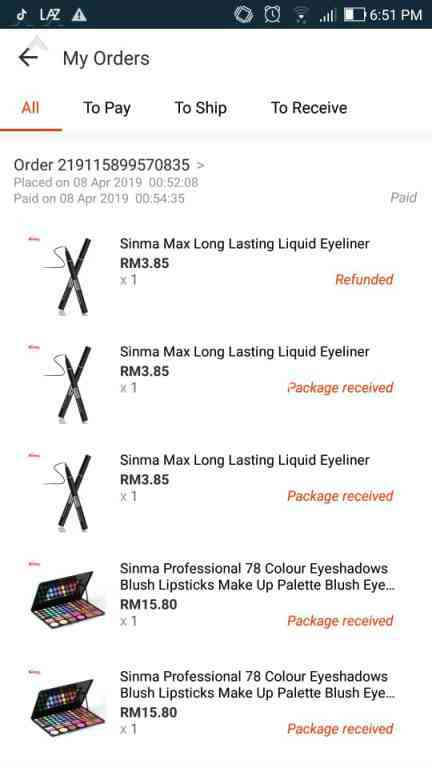 I purchased from the same company which is Sinma Fashion.Please do check down the document that i upload which is return and received documents.In the documents its showed that the items that I sent already received.Please do reply and get me a solution. My order tracking number is 219115899570835 and RA is 202677453270835. I received totally different item compared to the items that i ordered.So i already returned back the items.My concern is why one item only refunded compared to my oyher 4 items? What happen to my other 4 items that i purchased ? My order tracking number is 219115899570835 and RA number is 202677453270835.Please solve this as soon as possible.You may check in the document that i send.Only one item refunded compared to my other 4 items. Hari tu cakap nak call balik tapi sampai sekarang diam diri..call balik tak jawap?? Apa cerita ni..